We have many owls in Pennsylvania. You can even get a picture of a short eared owl on your Pennsylvania license plate. Pennsylvania also has barn owls, saw-whet owls, and long eared owls. 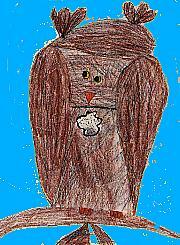 Our class decided to research the great horned owl. 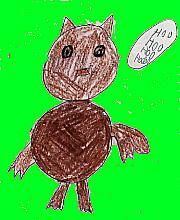 Keifer: The great horned owl eats small rodents. It lives on cliffs. Sometimes it takes other birds nests. The great horned owl could growup to 18 to 25 inches tall. It makes the sound hoo-hoo-hoo-hoo. 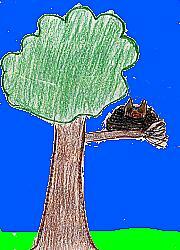 The habitat it lives in is the forest, woodlots, stream sides, and open country. Glenn: The great horned owl belongs to the family strigidae. A long time ago you were able to kill the owl and get money for it. Now if you kill a great horned owl you will get a fine. It eats birds, rats, mice, rabbits, skunks and squirrels. It say hoo-hoo-hoo. Heidi D.: The common name is the great horned owl. The scientific name is bubo virginianus. The name of the great horned owl comes from the two tufts of feathers on the top of their head. It eats birds, rats,mice, and rabbits. The colors of the great horned owl are brown with a white throat patch. It has yellow eyes. It lives all around the UnitedStates. 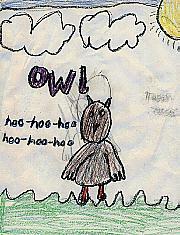 Lacey: The great horned owl sounds like hoo-hoo-hoo-hoo. 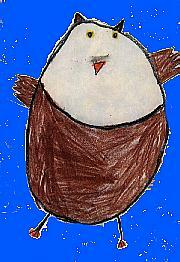 It is a tall bird that lives in North America. The great horned owl eats rats, mice, and rabbits. It is important to our gardens. Heidi: The great horned owl eats rabbits, squirrels, or anything that is small enough. 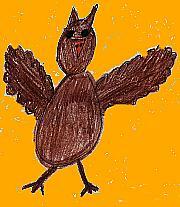 It is a very majestic and secretive bird. It lives in North America. 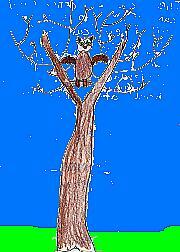 The great horned owl lives in the hollow of trees. Owls are usually out at night. Lindsey: The great horned owl's eggs take 23 to 35 days to hatch. It lives in other bird's nests. It eats at night. The name of the great horned owl comes from the two tufts of feathers on it's head. Megan: The great horned owl lives in North and South America. They live in hollow trees. It can grow to be 18 to 25 inches tall. It's wing span can be 60 inches wide. The sound it makes is hoo-hoo-hoo-hoo. The baby owls can fly in about 9 to 10 weeks. It eats at night. The scientific name is bubo virginianas. 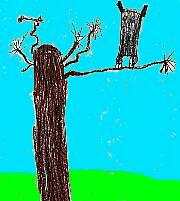 Matt: The great horned owl lives in a tree. They live all around the United States. A long time ago you could hunt the great horned owl, but now you would get a fine if you killed one. The scientific name is bubo virginianas. Our teacher had a great horned owl at her house. She wanted to bring it to school to show us, but a game warden took it. It has yellow eyes. Meisha: The baby great horned owl can fly in about 9 - 10 weeks. 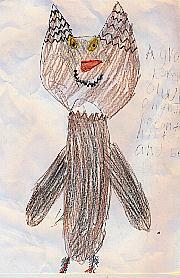 The owl is brown and black. The owl can grow to be 18 to 25 inches tall and have a wing span of 60 inches. The great horned owl belongs to the family strigidae. The species name is virginianus. Ryan: The great horned owl lives in the United States and has a white throat patch. It eats mice, small dogs, rats, birds, rabbits,squirrels, oppossums, skunks, geese, hawks, small owls, snakes,lizards,frogs, and fish. It can be 18 to 25 inches tall and have a wing span of60 inches. It makes a sound like hoo-hoo-hoo-hoo. It has two tufts of feathers on the top of his head that looks like horns. That is why it is called the great horned owl. Matthew: The great horned owl can grow to be 18 to 25 inches tall. They can be found in forests all over North America. The great horned owl belongs to the family strigidae. The species name is virginianus. They mostly hunt at night and eat any small animals. Rebecca: The eggs of the great horned owl are a creamy white. They begin nesting in early May so that the baby birds can learn hunting skills. The eggs hatch in 28 to 35 days. 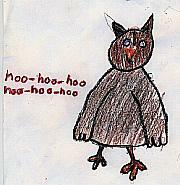 The sound of the great horned owl is five or six hoots, hoo-hoo-hoo-hoo-hoo. Females hoots are saidto be higher pitched. They eat small rodents and birds. Sarah: The great horned owl eats anything it can fit in it's talons and beak. It lives in North America in hollow trees, caves or cliffs. The great horned owl can grow to be 18 to 25 inches tall. It has tufts of feathers on his head that look like horns. It can be brown, black, or grey and has yellow eyes.